Objective To define the effects of withdrawing disease-modifying antirheumatic drug (DMARD) treatment from patients with established rheumatoid arthritis (RA) receiving stable, effective long-term DMARD treatment. Methods A systematic literature search was conducted. Studies were included that were of high quality and enrolled adults with RA over 2 years' duration. A meta-analysis was performed on the number of disease flares in groups withdrawn from DMARD treatment compared with those who continued to receive DMARD. Results The randomised controlled trial data were pooled into a meta-analysis and this showed that patients who withdrew from DMARD had a significantly worse risk of disease flare or deterioration than those who continued DMARD treatment. Conclusion In patients who have their disease adequately controlled by DMARD and wish to reduce the dose or withdraw them, this should be done cautiously. Their disease activity should be monitored carefully so that they recommence DMARD therapy in the event of disease flare or deterioration. There is extensive evidence from randomised controlled trials (RCT) that disease-modifying antirheumatic drugs (DMARD) are effective for treating rheumatoid arthritis (RA). They not only reduce symptoms but also improve function and limit erosive joint damage. Although many DMARD have been evaluated, several are rarely used and methotrexate and sulphasalazine are currently the dominant DMARD in the UK and elsewhere.1 Prednisolone and other glucocorticoids also have disease-modifying effects2 and are often classed alongside conventional DMARD. A key question is whether or not DMARD, including steroids, can be reduced in patients with stable established RA who have been on long-term treatment with these drugs. 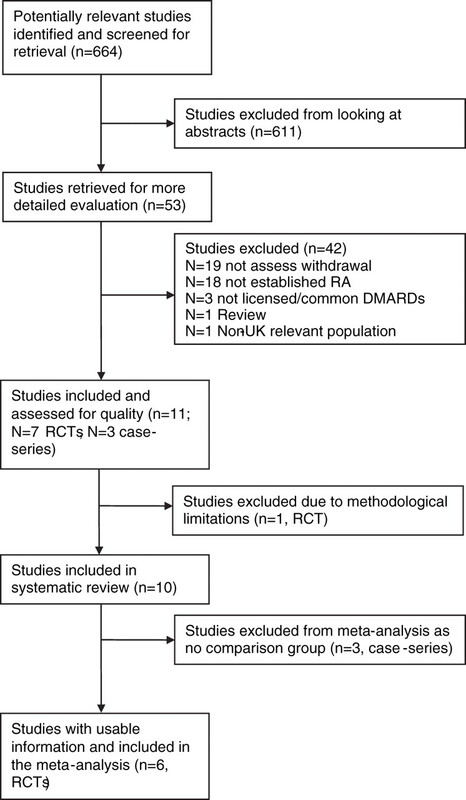 We have systematically reviewed the evidence from published trials and observational studies to examine whether or not DMARD withdrawal is feasible and appropriate in patients with stable disease. We have undertaken a meta-analysis of the trials to determine the overall effect of withdrawing DMARD. For the purposes of this review, corticosteroids have been included because of their disease-modifying properties. We have not evaluated studies in early RA as we consider the question of treatment withdrawal is somewhat different in this situation. Although we intended to extend our review into biological drugs, preliminary evaluation showed there is insufficient primary research to justify a systematic review on this topic. Details of the methods (inclusion criteria, search strategy, data extraction and analysis and quality assessment) can be found as supplementary material (see additional supplementary file, available online only). We identified 664 potentially relevant studies and 52 full articles were selected for initial review. We excluded 43 studies for the following reasons (figure 1): 19 did not deal primarily with DMARD withdrawals; 18 did not study established RA (disease duration under 2 years); three used drugs that are not licensed in the UK or are in limited use, one was a review article, one was a non-UK relevant population (Japanese) and one5 was excluded as a result of poor methodology (unblinded and no intention-to-treat (ITT) analysis). The remaining nine studies6,–,14 were included in the systematic review; six were RCT and three were case series (table 1). They all assessed the effects of withdrawal or dose titration of DMARD in patients with established RA. Flow of included studies. RCT, randomised controlled trial. The six RCT7,–,9 11 12 14 were randomised parallel-designed placebo-controlled studies that lasted between 1 and 24 months (see table 1). They enrolled 503 patients (range 10–285 in different studies) and examined the effects of withdrawing methotrexate, gold, penicillamine, azathioprine or a range of DMARD. In five RCT7 9 11 12 14 DMARD were withdrawn and in one8 they were given at reducing doses. Four RCT8 11 12 14 recorded RA flares as an outcome measure; one9 recorded clinical deterioration and one7 treatment failure. One RCT7 was of high quality (given a ‘++’ rating) and the remaining five were of intermediate quality (given a ‘+’ rating due to lack of ITT analysis and one trial was also not double blinded). Only the high quality trial7 mentioned an ITT analysis. The risks of flare or clinical deterioration were evaluated in a meta-analysis. Pooled data from the six RCT showed that patients who remained on DMARD at their initial dosage were significantly less likely to experience flares or worsening in their RA than patients who discontinued treatment (figure 2). The relative risk of a flare or deterioration in RA was 0.31 (95% CI 0.16 to 0.57, p<0.001). As tests for heterogeneity (figure 2) showed borderline heterogeneity between the trials (I2 54%; p=0.05 for χ2 test) a random effects model was used. Forest plot: number of patients with disease flare or deterioration when continuing compared with withdrawing disease-modifying antirheumatic drug (DMARD) treatment. RR, relative risk. Sensitivity analyses examined several possible sources of heterogeneity including differences in follow-up times (under and over 1 year), trial design (tapered dose reduction or total DMARD withdrawal) and size of trial (over and under 30 patients). In all instances the relative risk and heterogeneity remained similar (data not shown). The largest 12-month case series6 evaluated 210 patients whose dose of methotrexate had been stabilised and were subsequently treated with infliximab. The study examined whether these patients maintained a clinical response while tapering their methotrexate dose (5 mg increments every 2 months). Tapering commenced if patients achieved clinical improvement after 22 weeks of infliximab therapy (≥40% reduction in combined joint count). A total of 159 patients (76%) achieved this clinical response (responders) and therefore had their methotrexate tapered (mean methotrexate doses were reduced from 17 to 7 mg per week). Over the remaining 32 weeks of the trial, 79% of the responders required an increased infliximab dose and 42% experienced a relapse of disease or a loss of response. Another 12-month case series13 of 15 patients with stable RA receiving methotrexate found that reducing treatment from weekly to fortnightly resulted in two patients (13%) having a disease flare while 13 patients (87%) remained unchanged. A final case series10 of 38 patients with stable RA receiving prednisolone followed for variable periods of time evaluated tapering the dose by 1 mg per month. Ten patients (26%) successfully stopped prednisolone, 23 patients (61%) reported a flare of disease and five patients (13%) withdrew from the study. This is the first systematic review and meta-analysis that has looked at the effect of withdrawing DMARD on disease flare or deterioration in patients with established RA. Nine studies (six RCT and three case series) were included in the review and the six RCT were included in a meta-analysis. The pooled estimates of the RCT data showed that DMARD withdrawal or dose tapering was significantly worse than continuing DMARD treatment for the number of patients experiencing a deterioration or flare of disease. All of the RCT except one7,–,9 11 12 14 had the same direction of effect: more patients withdrawing DMARD treatment experienced disease flare or deterioration compared with those who continued DMARD treatment. Two6 10 of the three case series showed that withdrawing or reducing DMARD treatment led to a high number of patients having disease flare (42% of patients in the Fleischmann trial6 and 61% in the Bacon trial).10 The third case series13 found that only 13% of patients who had their DMARD regimen reduced had a flare of disease at follow-up. Analysis of the data used in the meta-analysis showed that there was borderline heterogeneity between the trials (I2 54%; p=0.05 for χ2 test). This is a limitation of the pooled data. One potential explanation for the heterogeneity seen was the range of trial follow-up times, which ranged from only 1 month to 2 years (table 1). All trials except one11 had a follow-up time of at least 6 months. However, the results (figure 2) show that the effect size for the Kremer trial11 is comparable with the longer trials. This suggests that many flares occur soon after withdrawing the DMARD. Differences in the type of DMARD used may also have contributed to heterogeneity; each trial used a different DMARD or assessed all types of DMARD together. Heterogeneity may also have been cause by differences in the design of the trials. Two trials tapered the dose of DMARD,8 14 whereas the rest used complete withdrawal. It was deemed appropriate to pool both full and partial withdrawal trials together because both of these scenarios occur in clinical practice. Only one trial14 showed that withdrawal of DMARD was better than continuation for a number of patients with flares. This may be because the trial used gold as the DMARD under investigation, and the beneficial effect of gold has been stated to persist for at least 12 months after discontinuation (1 g gold for at least 6 months),15 16 and the dose of gold used in the trial was greater than 1 g before withdrawal. In addition, in that trial the dose was tapered, not fully withdrawn, which may also have enhanced the longevity of its effects over the 2-year follow-up period. It was not possible to draw a conclusion about the effect of DMARD withdrawal on different subgroups of patients (those with different rheumatoid status, disease duration or erosive disease) because most of the trials did not report data for each of these subgroups. However, it is intuitively likely that flares would occur more often in those with a more severe or a worse prognosis of disease. The issue of withdrawing biological drugs after patients have achieved sustained remission is a burning question for healthcare professionals with an interest in rheumatology. Unfortunately there is a lack of primary research in this area, and as a consequence we were unable to address the question in the current systematic review. The theoretical risks and benefits of tapering or withdrawing biological drugs have been considered by Berthelot and Varin.17 It is an area in which more primary research is needed. The authors would like to thank the following NCC-CC experts: Robert Grant (technical advisor and statistician) who commented on the initial draft; Dr Jose Diaz (research fellow) who acted as a second reviewer and assessor of the quality of the trials included; Jill Parnham (assistant director of NCC-CC) for her invaluable comments and help with editing. The authors also wish to thank the National Institute for Health and Clinical Excellence Rheumatoid Arthritis National Guideline Development Group for providing expert knowledge in the field, and in particular the Chairman, Dr Michael Rudolf.
. A survey of British rheumatologists' DMARD preferences for rheumatoid arthritis. Rheumatology (Oxford) 2004;43:206–10.
. Randomized withdrawal of long-term prednisolone treatment in rheumatoid arthritis: effects on inflammation and bone mineral density. Scand J Rheumatol 2007;36:351–8.
. Methotrexate dosage reduction in patients with rheumatoid arthritis beginning therapy with infliximab: the Infliximab Rheumatoid Arthritis Methotrexate Tapering (iRAMT) trial. Curr Med Res Opin 2005;21:1181–90.
. Randomized, placebo controlled trial of withdrawal of slow-acting antirheumatic drugs and of observer bias in rheumatoid arthritis. Scand J Rheumatol 1996;25:194–9.
. Long-term azathioprine in rheumatoid arthritis: a double-blind study. Ann Rheum Dis 1981;40:560–3.
. Corticosteroid withdrawal in rheumatoid arthritis. Lancet 1966;2:935–7.
. Methotrexate treatment of rheumatoid arthritis: is a fortnightly maintenance schedule enough? Ann Rheum Dis 1992;51:1330–1.
. A double-blind study on the effect of discontinuation of gold therapy in patients with rheumatoid arthritis. Clin Rheumatol 1986;5:56–61. GOLD therapy in rheumatoid arthritis. Report of a multicentre control trial. Ann Rheum Dis 1960;19:95–119. Research Sub-Committee of the Empire Rheumatism Council. Gold therapy in rheumatoid arthritis: final report of a multicentre controlled trial. Ann Rheum Dis 1961;20:315–34.
. Is dosage reduction appropriate in patients who respond well to anti-TNF-alpha agents? Joint Bone Spine 2004;71:257–60.